This is a Korean name; the family name is Sin. Shin Saimdang (申師任堂, December 5, 1504 – June 20, 1551) was a Korean artist, writer, calligraphist, and poet. She was born in Gangwondo Gangneungbu jugheonli bugpyeongchon (강원도 강릉부 죽헌리 북평촌) on 29 October 1504. Her birth home, Ojukheon, which is also her mother's side home, is well-preserved to this day. She was the mother of the Korean Confucian scholar Yi I. Often held up as a model of Confucian ideals, her respectful nickname was Eojin Eomeoni (어진 어머니; "Wise Mother"). Her real name was Shin In Seon(신인선). Her pen names were Saim, Saimdang, Inimdang, and Imsajae. She lived during the same time as poetess Heo Nansseolheon, another poetess of her time. They were considered rivals. Shin Saimdang was born and raised in Gangneung at the home of her maternal grandparents. Her father, Shin Myeonghwa (申命和) was a government official but did not actively join politics. Her mother was Lady Yi, the daughter of Yi Saon (李思溫). Saimdang was the second child of five daughters. Her father Shin Myeonghwa continued his imperial examination preparation with his wife's side family's assistance, and visited home a few times in a year. Saimdang's mother Lee made sure her father and husband would not have conflict and assisted her husband's study. However, Shin Myeonghwa did not go beyond jinsa test(진사), an elementary test for yangban, and gave up the daegwa(대과) test due to the massacre of scholars at kimyo year(기묘사화). Saimdang's mother kept living with her parents even after marriage, which freed her from the stress other housewives had to endure. This enabled her to educate her children by her own beliefs. Saimdang's grandfather's beliefs greatly influenced Saimdang through her wise mother. Her maternal grandfather taught her as he would have taught a grandson. Being raised in that atmosphere, Shin Saimdang received an education that was not common for women of that era. Besides literature and poetry, she was adept at calligraphy, embroidery, and painting. Although she was a woman, she had abundant knowledge of Neo-Confucianism, history, and literature, which surprised her father's visitors. Her father was a friend of Jo Gwangjo, but after the massacre of scholars at kimyo year(기묘사화), he gave up his government post and moved to Gangneung. He treated his sons and daughters equally, so he taught Saimdang how to read. Saimdang and her four sisters learned Thousand Character Classic, Dongmongseonseub(동몽선습), Mingxin baojian, and confucianism from Shin Myeonghwa, which filled her with knowledge. Saimdang was especially talented, earning her father's favor. Her father lived in Hansung(한성부), so she lived apart from her father for 16 years. Since her childhood, she was gifted at writing and drawing, earning praise from Isuggwon(이숙권). Because she was raised in a household that had no sons, she spent a lot of time at her parents' home. Shin Myeonghwa chose Yi Wonsu (李元秀) as his son-in-law. At that time, he was unemployed and his father had died. There were Yeonguijeong and Jwauijeong among his ancestors, but his family was poor, and many people said Shin Myeonghwa did not have insight. However, Shin Myeonghwa priorised marrying his daughter off to a man who would allow her to continue with her artwork, and so was happy for the marriage to take place, as Wonsu had no qualms with Saimdang continuing to pursue art. At the age of 19, she married Commander Yi Wonsu, and with the consent of her husband she continued to spend time at her parents' home. Saimdang was able to cultivate her talents despite the rigid Confucian society thanks to an unconventional household and an understanding husband. Having no brothers, she received an education that would have been bequeathed only to a son, and this background greatly influenced the way she educated her children. She accompanied her husband to his official posts in Seoul and in rural towns and gave birth to Yi I in Gangneung. At 1522 August 20, Saimdang married Yi Wonsu and following tradition, lived at Gangneung until they moved to Seoul. They had eight children, five boys and three girls. Yi I is Saimdang's third son. Her husband's house was at Paju but at the end of the year they got married, her father died, so she moved back and forth between her two homes and cared for her mother. After that, she moved to various places including Hansungbu and Pyeongchang. At the age of 33, she went back to Gangneung to give birth to her 3rd baby, who grew up to become Yi I. At 1537, on the way back to Hansungbu with her baby, she stood on top of a hill at Daegwallyeong looked back at a village she had just passed. She expressed her love for her mother through a poem, which will later on be recited by thousands of people throughout the ages. Since she was 38, she managed a new house in Hansungbu and lived with her mother. Although in current standards, Saimdang could be the best wife, back then, good wives were those who obeyed their husbands well. Saimdang did not listen to her husband Yi Wonsu easily. Promising 10 years of separation for his study, she sent her husband to a good mountain. When he came back yearning for his wife, she reprehended him, threatening to cut off her hair if he didn’t study hard. In spite of her efforts, Yi Wonsu quit studying in 3 years. She noticed that her husband, Yi Wonsu, loved a kisaeng named Kwon. Shin Saimdang became confused. When Yi Wonsu began living with Kwon, Saimdang strongly disapproved of it and the couple's relationship cooled. Shin Saimdang, who foresaw her death, asked her husband not to marry another woman even after she died. Yi Wonsu argued that Confucius, Zengzi, and Zhou Dunyi had broken their marriages also. However, when Shin Saimdang contradicted him by telling him that none of those people had remarried, Yi had nothing to say. Her husband Yi Wonsu would have wanted a woman who would not make him feel lonely. And the woman who could satisfy him was Kwon. However, Kwon was a rash girl who acted unpredictably, the opposite of Shin Saimdang. When Shin Saimdang discovered the presence of Kwon, she once again asked her husband not to invite Kwon to their home. Yi Wonsu and Shin Saimdang's bad relationship also affected their children. Since his parent's marital relations were not good, Yi I wanted a peaceful family life. Yi I loved his mother dearly, so when Shin Saimdang got sick, he went to the shrine where his maternal grandfather's spirit tablet was, and prayed for his mother for one hour every day. The family members who were searching for missing Yi I were moved when they found the young child sincerely praying in hopes of his mother recovering. Despite his efforts, her illness got worse. Sin Saimdang died suddenly after moving to the Pyongan region. Shin Saimdang died on May 17, 1551, at the age of 48. As a result of her death, her son Yi I wandered about with questions about the cause of life and death. Before Shin Saimdang died, she realized that her husband, Yi Wonsu, was going to take Kwon home. Quoting the Confucian scriptures, she tried to convince him not to marry Kwon. However, after her death, Yi wonsu married Kwon, and conflicted with his son Yi I. Unlike Shin Saimdang who was a gentle and caring mother, Kwon liked to drink. Shin Saimdang's children suffered because of Kwon, and Yi I ran away from home. In Joseon, no matter how talented she was, women were not allowed to show their gifts and talents to the world after marriage. However, Saimdang was able to develop her talents by two reasons: the first is that she didn’t have any brothers, so she was able to live at her home instead of her husband's, and secondly, her father's foresight of selecting her husband. As described above, Shin Myeonghwa tried his best to select his son-in-law who would let Saimdang develop her skills as much as possible. Therefore, Saimdang's husband, Yi Wonsu, was a good husband who respected and listened to his wife. Shin Saimdang's artwork is known for its delicate beauty; insects, flowers, butterflies, orchids, grapes, fish, and landscapes were some of her favorite themes. Approximately 40 paintings of ink and stonepaint colors remain, although it is believed that many others exist. Unfortunately, not much of her calligraphy remains, but her style was greatly praised in her time, with high-ranking officials and connoisseurs writing records of her work. The scholar Eo Sukgwon of Myeongjong mentioned in his book Paegwan Japgi (Hangul:패관잡기, hanja:稗官雜記, "The Storyteller's Miscellany") that Saimdang's paintings of grapes and landscapes compared to those of the notable artist Ahn Gyeon. In 1868, upon admiring the work of Saimdang, the governor of Gangneung remarked that "Saimdang's calligraphy is thoughtfully written, with nobility and elegance, serenity and purity, filled with the lady's virtue". Her talent for painting and poetry was inherited to her children. For example, Yi U was so talented in the art that there is an anecdote that "He drew insects using muk, and then the chickens were chasing after it since it looked like real insects." Yi U was also talented in poetry. His brother Yi I said: "If[Yi U concentrated in scholarship, he would be better than me." The eldest daughter of Shin Saimdang, Mae Chang, was also good at poetry, so she was known as "little Shin Saimdang". After Japanese invasion of Korea in 1592, the lives of women were very restricted because of feudalism. People thought women should only do housework. Shin Saimdang was also restricted by feudalism, but she tried to develop herself. She was an artist who represented Joseon. She was also admired as an example of a good woman and a good wife, being compared [where, by whom ?] with Queen Munjeong, Jeong Nan-jeong, and Hwang Jini. After her death, she was regarded as a wonderful mother who raised Yi I, the role model of politicians. 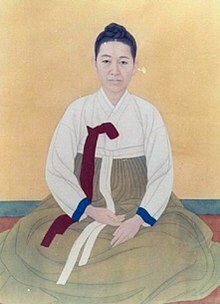 After completing the study of Yi I in the late Joseon dynasty, Uhm Song Syoheol, praised her poetry, writing, calligraphy, and paintings and said, "There is a reason that her son is Yi I." National respect and worship for her were strengthened. Song Si-yeol tried to praise Yi I's parents as a saint by establishing his teacher Yi I, but his father, Yi Wonsu, was an ineffective figure, so eventually became a saint of Yi I's mother, Shin Saimdang. Shin Saimdang was a wise and benevolent mother who had both goodness and virtue, but could not stay with her children for a long time. Today, the ideology of the 'place of a good mother' of that time is viewed as a remnant of Japanese colonial rule and the old patriarchal society. There is also a view that Shin Saimdang was abused as a means of devaluing women. Women have been dismissed from history and devalued according to the past social climate. We can see that from our Korean textbooks, in which Shin Saimdang was portrayed as a representative of women. She was good at writing poet, drawing, and calligraphy, and other various things, but the Korean textbook emphasizes her as the mother of Yi I. It says Shin Saimdang had always educated her children with careful attitude and raised seven children. Rather than describing her personal ability, it shows Shin Saimdang only as someone's mother. According to the textbook, in history, women have assumed such a limited role. It is true that she was a good mother, but we cannot say that she fit in with the ideal mother of the Joseon dynasty. So some scholars say that she pioneered her own life. Feminist critics, however, have criticized this selection as reinforcing sexist stereotypes about women's roles. Bank of Korea said that they put Shin Saimdang in the money because of gender equality. But many women said that Shin Saimdang's image does not represent gender equality because her image is a good wife and a wise mother. She is the ideal woman of the past (the Joseon dynasty), not today. Portrayed by Lee Young-ae and Park Hye-su in the 2017 SBS TV series Saimdang, Memoir of Colors. ^ Kim-Renaud, Young-Key (2015-02-24). Creative Women of Korea: The Fifteenth Through the Twentieth Centuries. Taylor & Francis Group. p. 59. ISBN 9781315705378. ^ "황당한 한은의 '화폐인물' 선정이유 "어진 아내에 영재교육에 남다른 성과" (Korean)". The Hankyoreh. Oct 4, 2017. ^ "'Best mom' chosen as face of currency". Reuters. Nov 6, 2007. Kim-Renand, Young-Key. Creative Women of Korea: the Fifteenth Through the Twentieth Centuries. M.E. Sharpe, Inc., 2004. Wikimedia Commons has media related to Shin Saimdang. This page was last edited on 4 February 2019, at 03:25 (UTC).